The first thing that comes to my mind is pasta. I love pasta 365 days a year. Mmm, carbs. But there’s something about eating a bowl of pasta on the couch, cuddled under two blankets that gives me warm fuzzy feelings. I could be happy with a bowl of pasta, butter, and parmesan cheese. That might sound lame but it’s my go to meal when I don’t know what to eat. In fact, I actually had that very exact meal for lunch yesterday. Add to the pasta a little bit of healthy beans for protein and fiber and now pasta isn’t just carb loading, it’s also a real meal. 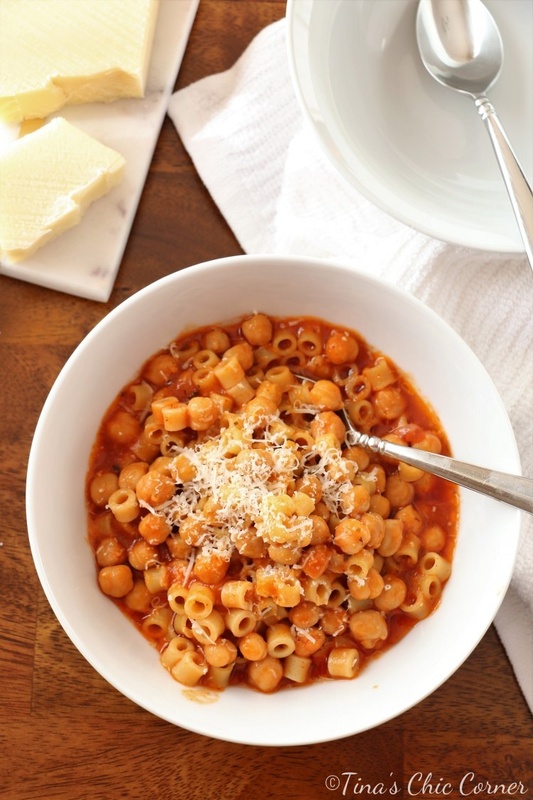 I love chickpeas and I love pasta, this pasta con ceci is a match made in heaven. It’s hard to explain why this dish is so amazingly delicious so you’ll have to trust me and try it to see what I’m talking about. There are many versions of this recipe. 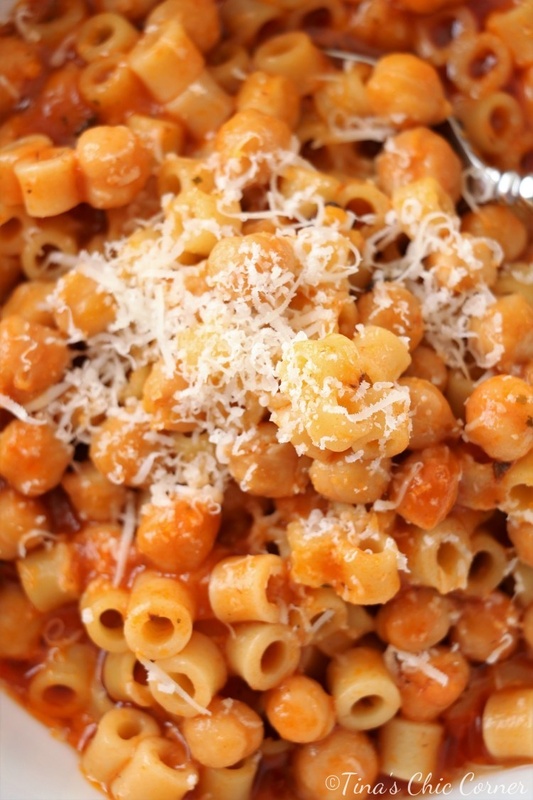 Different shapes of pasta, different kinds of beans, different kinds of sauce. In fact, some recipes have so much sauce, they are effectively soup. This recipe is not a soup. Instead this is like a pasta dish with a very thin sauce. Most of the sauce will be absorbed, especially if you reheat it the next day, then there will be virtually no liquid at all. My mom and Italian grandma each have their own way of making it and both are slightly different from this one. Their recipes are equally delicious. They don’t follow a specific recipe (i.e. it’s a little bit of this and a little bit of that) and every time it came out amazing. I haven’t been able to figure out the proportions of the ingredients to get the exact taste I remember as a kid so I decided to try something new. I showed this recipe to my mom last week and she thinks it sounds so delicious that even she wants to try it. Note: I like the full 4 tablespoons of olive oil, but my husband prefers less. This is a matter of preference so I recommend that you start with 3 tablespoons, taste it when it’s done, and add more oil if you find you prefer it that way. In a saucepan over medium heat, heat the olive oil. Stir in the tomato paste and salt and cook for about 30 seconds. 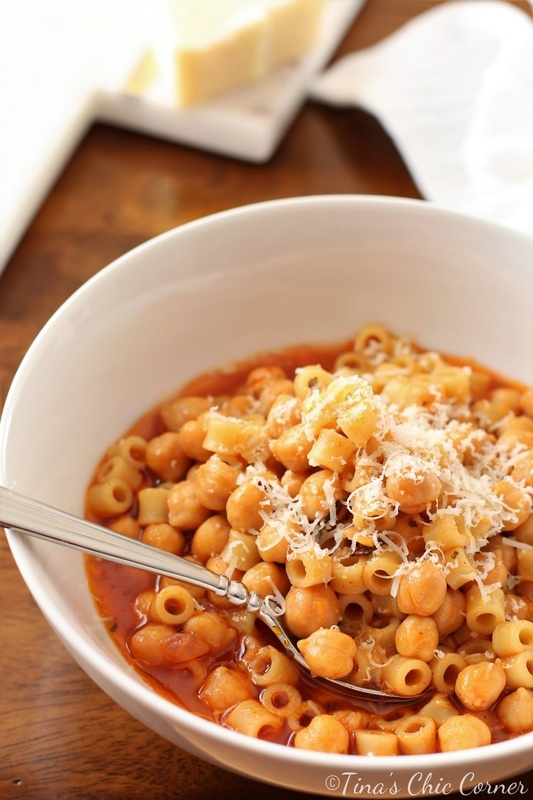 Stir in the chickpeas, uncooked pasta, and boiling water. Lower the heat to simmer and cook for about 15 minutes or until most of the liquid has been absorbed and the pasta is tender. Tina your pictures are so amazing that I could smell this delicious looking dish. Sounds delish and easy to make. Will definitely try it soon! Love your recipes, just signed up for your blog. You are welcome! I am home from work today a bit under the weather and am going to make this. Will let you know how it comes out. It’s a snowy, cold New England day, perfect day to have it. Will let you know how it comes out! Feel better, Marie! I’m in CT and we’re getting sleet/rain… definitely a perfect meal for today. I’d love to know what you think of this recipe. I am in central MA, same weather here. The schools are either delayed or out. Will definitely let you know what I think. My mom was a full blood Italian, we always ate great dishes! Thanks for sharing. Well Tina I made your dish today. It was quick and easy and so good. I added a dash of Italian seasoning to it. I couldn’t stop eating it! It is my new go to recipe when I want a fast pasta dish. The ceci beans in it were so good. I did only add three tablespoons of olive oil and it was perfect! Thanks again.